Hello lovely friends! Thanks so much for dropping by to say g'day. Will you stay for a quick cuppa with me? It seems like forever since I have joined in the weekly Tea Party Link-ups that happen every Tuesday in Blogland! I am so happy to be finally joining in again today! This week I am sharing pictures of all of the tea parties I have had over the last couple of years. Some pictures are from home and some are from abroad. I think you might get the sense once you have seen them all that I am a big fan of taking tea! Drinking a daily cup of tea will surely starve the apothecary. Time for tea in the USA! Time for Yorkshire tea in my Spode tea cup at home! Tea time at home in the Den! Time for tea...any time of day! Now it's time to do the dishes! Thank you so much for dropping by to visit! I'm going to your house for tea!!! Wonderful!!!!! what a lovely tour through all your wonderful posts. I am happy that you can again join in those wonderful parties. You shared a lot of remarkable tea quotes. Thank you for showing this all. I enjoyed your tea time tour! What a wonderful tour you have taken me on! I enjoyed all your tea quotes and every stop we made! I love your Spode teacup! Thanks for having me and it's nice to have you join me once again. Natasha, What a lovely tea party! I love your set and your darling children's faces. They look so happy! You have set so many wonderful teas for us to be a part of... Love the quotes too... NOW I must go pour a myself a nice cup of tea! they just make you feel warm an fuzzy inside. Love your post ... and the fact that your children enjoy teatime! Nothing brings peaceful thoughts like a cup of tea! Thanks so much for sharing. Look at all your tea times around the world!!! Amazing! You know that makes me so jealous :) A good jealous! A Oh that is so amazing jealous!!! It is so fun to see you family slowing down to enjoy each other over a cup of tea wherever you might be! & it looks just as fab in your own home! & those gloves make doing the dishes look fun! Take Care Natasha!!! Natasha, I know I would enjoy having a cup of tea with you. All your tea parties look grand but just talking to you would be great fun. Your tea-time looks so inviting! Tea and goodies in so many places, I loved them all. Lovely photos of your family and your tea times. You shared a number of very lovely tea cups and saucers. And the chai tea cookies....YUM! Natasha, I decided to join all of the tea parties you join and I'm so glad! I visited some lovely blogs and now have linked up with them. Thank you for sharing the heart-warming photos of your family. The one of your hubby cracks me up. :o) My boys take tea with us too..but never dear hubby. He is a die-hard water drinker. How wonderful that you guys get to travel to take tea. I'd love that! Great photos of all the happy tea times you had with your family. How your two beautiful children have grown. Okay, I'll help with the dishes. You just can't beat a good cuppa and with Yorkshire tea you always get a "proper brew"! I found you from the Middlest Sister (Libbie's) blog. We love to take tea, here in WI, too! In fact, on these wintry cold days, I depend upon it to keep me warm! Your family looks lovely, as do all your beautiful photos of ways to take tea. Tea is wonderful anywhere. I love your tea in Hong Kong. I lived there for five years, and the many hotels had amazing teas. I love all the teatime fun that you have posted. Natasha, first of all lot of thanks for your superb Tea quote... Oh I can show this to my husband with authority (LOL). Its a lovely post and I think the most relaxing tea time is at home isn't? What a lovely tea time! I loved the tour and the gorgeous tea cups. First time at you're beautiful blog. Your tea time pictures are lovely. I adore all the pictures of your tea times. Your spode cup is lovely. yeas I like to have a cup of tea please...can I have a cookie with it ;-) or just a teasbiscuit..mm I love it..that brings me to an idea...i gone ...cooking water for a cup of tea, bye! Oh, I don't like tea...pregnancy aversion that stuck with me. Taking tea around the world--what an adventure! What a wonderful way to share tea. You can have tea anywhere and you have chosen wonderful places. So glad you hvae chosen to share with us here today. looking forward to seeing you soon. Everything was beautiful, nice and tasteful. Love the around the world! Great pictures! What lovely photos and images of tea time around the world. Such wonderful photos! Your black and white striped cups are so very beautiful! Love that you took your kiddos to tea in America. Beautiful tour, I enjoyed it very much. Good morning! I'm so happy to be here .... Lindo your blog and I am his follower! Be very welcome to HOUSE DECORATED! All of the information and quotes your provided is just priceless! I love that you have included your entire gorgeous family. My friend, you have taken tea in some really awesome places! I think that's fabulous! I really enjoyed all the different teapots and teacups...sooo pretty! I have to say that I just adore that pretty black and white striped teacup...it's lovely! I also loved the photo of your two beautiful children taking tea! Sooo sweet, my friend! There's no day, no conversation, no meeting or lazy afternoon that can't be improved by a cup of tea! Love the Spode! My daughters and I enjoy the whole afternoon tea ritual. Nice, happy post. I like all of those tea sets that you are showing in this post! They are so very pretty! 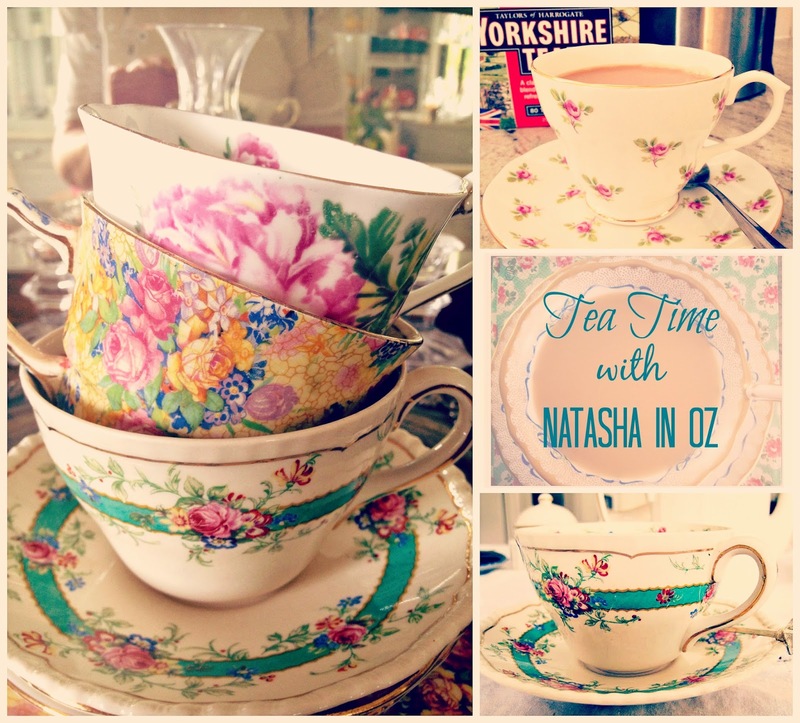 what a fun post, there is always time for a good cuppa tea! I enjoyed the tea pictures~! THanks for letting me peak in. Thank you for taking us on your travels. I enjoyed the pictures of your family too. What a neat post! I think that is one of the absolute coolest thing. I don't drink tea, but how cool to have these personal and beautiful pictures. I love it!!! This is a fantastic post! I just love all those photos of the many, many different types of teapots and teacups from all over the world! They're all so unique and so beautiful. It's amazing how the act of having tea time can have so many different tea wares! Ah, each occasion looks wonderful. I would love to be able to visit and share a cup of tea with you. What wonderful photos and quotes to read while having tea. This makes me remember my sweet British grandmother who had tea every single day at 4:00 pm. I loved staying at her house and getting to have tea with her..
Yorkshire tea huh? I need to try that! You make it look oh so lovely! Very nice. Hi Natasha! Oh, what a treat to sample so many wonder teas and see all of your pretty dishes. My daughter lived in England for a couple of years and she always drank Yorkshire tea! Your children are just beautiful! Like their mother, of course! What a terrifically charming stop on our little journey through Alphabe-Thursday's letter "T". Thanks for letting us tag along on your trips for tea! This is a lovely post, Natasha! Looks like you have done a lot of travelling - good that you always stopped for a nice cup of tea. Have a great wknd. This was such a fun tour through your world of tea! I love the pictuers of the precious children! Adorable. And the tea quips were insightful and fun! lovely tea pots and smiling shots..
Lovely! Teatime is great wherever you are :o) I love the photos, especially with your beautiful children. Tuesday Tune ~ Brooke Fraser. 5 Minute Laugh - A "Walk on the Wild Side." 5 Minute Laugh: A Problem with my BlackBerry. 5 Minutes with...Rebecca from Chow and Chatter! #TuesdayTune ~ Love is in the Air! Strawberry Cake for Valentine's Day!